Research tells us our brains deal with the overwhelming amount of information available to it by categorizing that information, often in terms of what is a danger, and what is not: e.g. fire is hot and a danger, sunsets are beautiful and not a threat. The information is cemented through experience. If you live anywhere near traffic, when you hear the screech of brakes, you expect to hear the sound of a crash (danger). If we don’t hear the crash sound, most of us breathe a sigh of relief and go about our business. The crash sound brings about another response (fear, anxiety). Over time, the responses are routinized; loud noises make you look around to assess danger, hot chocolate makes your mouth water; you do not have to stop and think each time, what does that mean? Because so many of our responses, both physical and emotional, are a matter of routine, it frees our brains to do other, more interesting things, such as shopping after Christmas sales. I found myself in just that situation the Friday after Christmas. One would think my past experience would have led me to avoid shopping on that day (Danger! Crowds! Debt! ), but my lack of experience and the failure of the battery in my beautiful watch led me to the mall to replace the battery at a fix it shop. I should have realized that fifty others would do the same, but I had never shopped at a mall on the 26th of December. Naively, I set out on my mission. I had no watch; after all, mine had a dead battery. I had no idea when “thirty minutes” would be up. Have you noticed that there aren’t many clocks in the malls? Kind of like casinos in that respect. The other problem is that I lack the shopping gene. I am a strategic shopper. I research before I go, swoop in, make the purchase and leave. My husband always told me I shop like a guy. I took it as a compliment. So, clueless, I wandered into the mega-department store in the mall and began my version of browsing. I discovered I was not very good at this. My rapid walk and horizon-scanning look was not in line with the sauntering required for successful browsing. I forced myself to slow down. After all, I had thirty minutes to kill. I began to notice that there were several items of clothing on the floor under dangling empty hangers. I stooped down and picked up one item and put it neatly back on the hanger. After the fifth stoop and hang, I was getting funny looks from the browsers, so I stopped. I did find one item, which I decided to purchase. I stood in line behind five other shoppers. Most of them held armloads of clothing. They weren’t alone. Many of them brought family members who stood with them in line. Periodically the primary shopper would talk and gesture to one of the assistant shoppers who would leave and return with additional items. I stood holding my one sweater, no assistant at hand. After about fifteen minutes (I’m guessing since I had no watch and there were no visible clocks), a very nice lady with a large basket of chocolate candy came by and offered us a chocolate to keep up our energy while we waited. Sweet! By the time I reached the cashier, she was glassy-eyed. I told her I had only one item. She smiled. “Thank heavens! I’ve been here six hours and it hasn’t let up!” I felt guilty for eating my piece of chocolate. She needed it far more than I did. My shopping complete, I returned to the fix it shop and picked up my beloved watch. It only took two hours! For those of you who do not live in California, and may not be cognizant of our customs, I am enclosing two photos of a typical California Christmas. Enjoy! 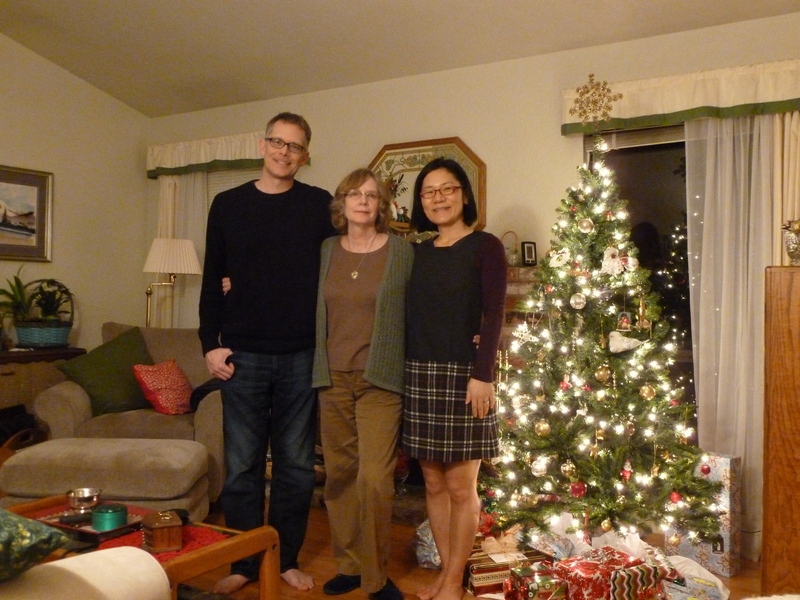 The California Christmas Tree with family pose. 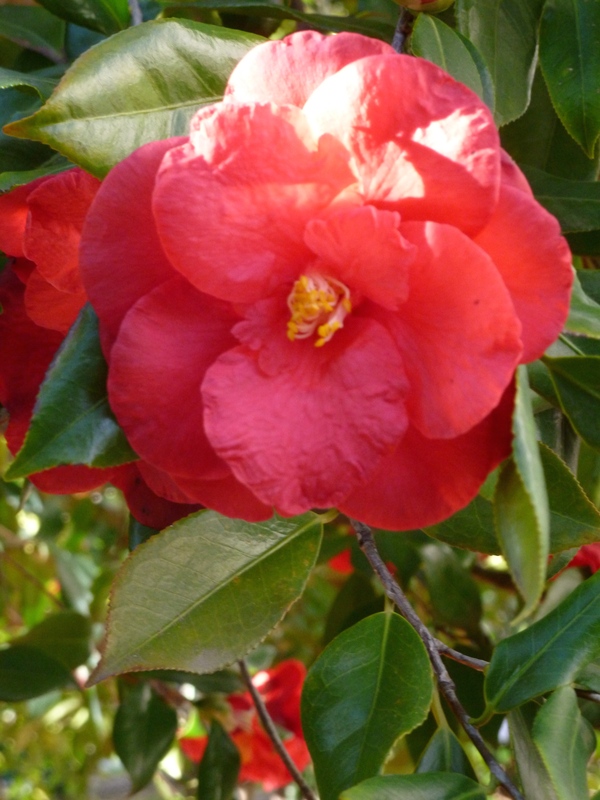 One of the Camellia blossoms in Capitol Park, Sacramento CA. My husband and I had been taking a tour of the California Coast over the last two years. I’ve posted many of the pictures of our trips. We had planned to continue our exploration of the coast, through Oregon and Washington State. My husband grew up in Washington. 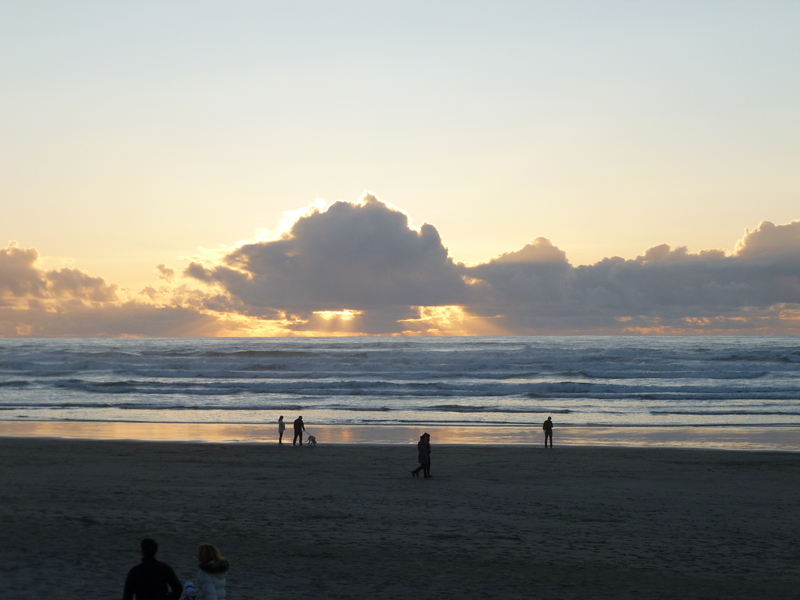 He wanted to revisit Cannon Beach Oregon and see Hay Stack Rock once again, but he did not make it. 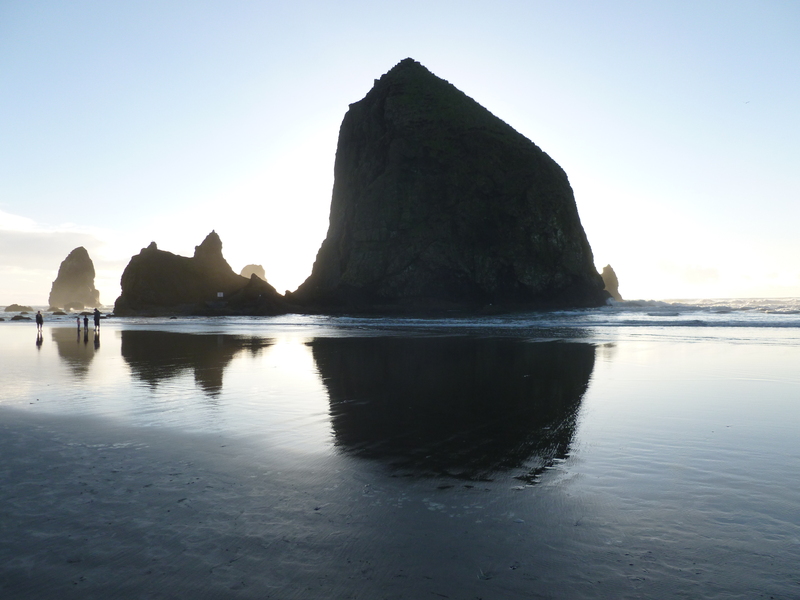 In November, we took his ashes and those of his younger brother, to Hay Stack Rock. Here are some photos of this haunting, beautiful beach.